Vdara Hotel & Spa, an internationally inspired all-suite hotel and spa designed for those who love the excitement of Las Vegas but prefer to enjoy it in an exclusive, non-gaming, smoke-free setting, has opened the doors to its latest luxury amenity — Vdara Club Lounge. Vdara Club Lounge — a secluded space welcoming guests with gourmet meals, a dedicated concierge service and a nightly social hour complete with complimentary libations. Vdara Club Lounge is a deluxe amenity for guests staying in the hotel’s Luxury Suites, City Corner Club Lounge Suites and Studio Fountain View Club Lounge Suites. Guests who choose any other accommodations may also access Vdara Club Lounge for a nightly fee ($75 Sunday – Thursday; $100 Friday – Saturday). Pre-Arrival Concierge: Ensuring each Vdara Club Lounge guest has a customized and stress-free stay, Vdara’s concierge contacts guests prior to arrival to assist with booking restaurant reservations, show tickets and any other needs. The dedicated concierge is available at Vdara Club Lounge to assist guests in-person throughout the duration of their stay. 6 p.m.; and desserts are offered from 6 p.m. – 8 p.m. Catering to guests on-the-run, a selection of grab-and-go items are stocked throughout the day. Social Hour: Each afternoon from 2 p.m. – 4 p.m., guests can enjoy the Club Lounge’s Social Hour with complimentary hors d’oeuvres and select beer and wine. Outside of those hours, beer, wine and craft cocktails are available for purchase. 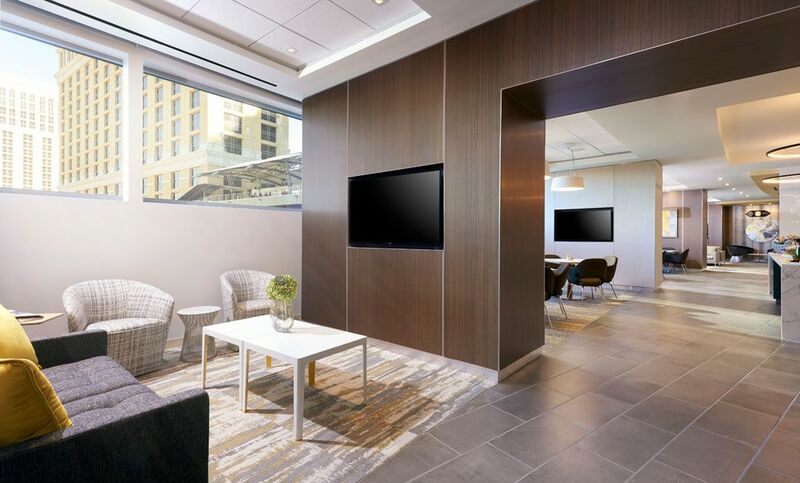 Collaborative Work Spaces: Vdara Club Lounge provides a naturally lit, comfortable and quiet place for guests to work. Access to convenient business services make productivity easy for guests away from the office. Reservations for Vdara Club Lounge suites can be booked now by visiting vdara.com or calling 702-590-2767.